﻿ Social Media Tips for the Time-Starved Business Owner » Red Mango Marketing! Let’s not beat around the bush here. Sometimes managing your social media is a real headache. You wear so many hats on any given day and inspiration seems hard to come by. Social media is the last thing you want to make time for. The point is, if you’re stressing out about social media, you’re probably overthinking it. Just think of social media as a digital extension of your brand — a place you where you can share things that represent your business and engage your audience. We’ll let you in on a little secret: you don’t need a big team to keep up with your social media activities. You just need the right tools and a plan to get things done in small chunks of time. We’d like to share some tips that work for us so you don’t have to run away from your computer the next time you’re supposed to post on social media. Let’s get started. Estimated time to complete: 5-10 mins. Content curation takes the pressure off of you to generate 100 percent of your content from scratch. Not only is it a huge timesaver, it’s also a great way to connect with others in your industry and deliver your audience value from a variety of sources. Content curation means looking for interesting and relevant content to share with your audience that’s written by others. No, this is not plagiarizing — as long as you give credit by tagging the source that created it. Tip: Here’s how to share other people’s content the right way. We know what you’re thinking. “Does this mean I have to scour the internet for interesting tidbits all day?” Nope. You just need the right tools that will do this for you. Use a tool like Feedly or Flipboard to do the searching and save you time. Here’s how it works: Select which websites you frequent to find shareable content and the tool will display articles from these sites in tidy drop-down categories. 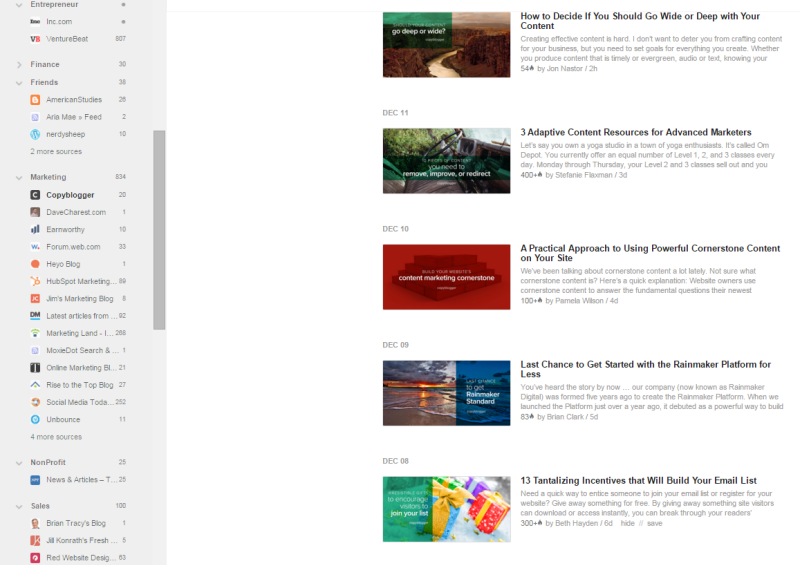 Each topic category will pull new articles into an easily digestible format. All you have to do is skim through and choose which articles you’d like to share with your audience. This streamlines the process because you’re not spending hours popping in and out of different websites, getting lost in the abyss of listicles and cat videos. Instead, you’re viewing all the latest articles in one central dashboard with clear headlines and synopses. Here’s an example from Feedly: Pocket is another great tool. Have you ever come across something you’d like to share, but didn’t have the time to do it right away? 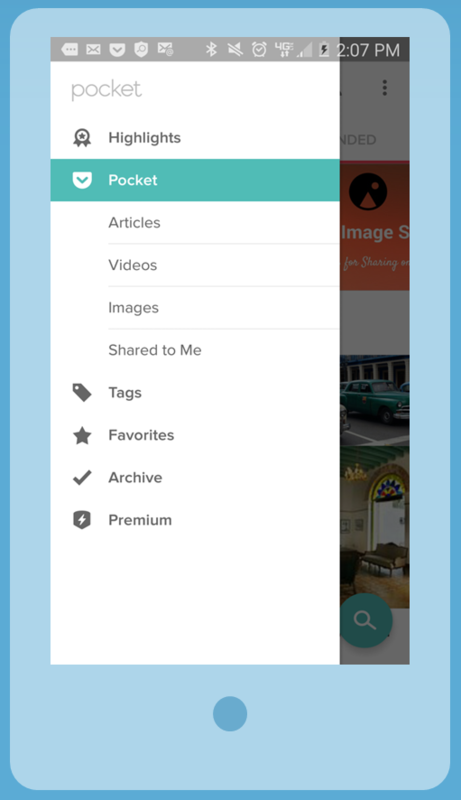 Pocket allows you to save articles, videos, or images so you can share the URL later. Score! Dare to share — in advance. Estimated time to complete: 10-15 minutes Once you get into a rhythm of finding content to share, set aside some time to schedule a few days’ worth of content at a time. Use a social media management dashboard tool, like MySocialSuite, to schedule content to post while you’re doing something else….like running your business or running your kids around to soccer practice. Copy the URLs for the content you’d like to share, draft up something to say about each article in a way that intrigues your audience to click it, and schedule your content to post ahead of time. It’s one of the best things since sliced bread…okay at least since social media was invented. Notice how we stay short and sweet to accommodate Twitter’s character limit, while on Facebook we have some room to go into more detail. Here’s some advice on how to automate your social media marketing the right way. Getting started with social media is like learning a new language. You might be slow at first, but if you stick with it you’ll notice it gets easier and you’ll pick up speed. Curate content, schedule posts ahead of time, and focus on what’s resonating with your audience. You may just find yourself having fun instead of struggling to find the time to make it happen! Ask us your social media questions or hop over to our Social Media Quickstarter for step-by-step instructions on building your social media presence on all the top networks. The post Social Media Tips for the Time-Starved Business Owner appeared first on Constant Contact Blogs. This entry was posted on Friday, June 24th, 2016 at 9:00 am	and is filed under Automation, News & Updates, Social Media, Social Media Marketing. You can follow any responses to this entry through the RSS 2.0 feed. Both comments and pings are currently closed.